November has flown by so quickly ...better get this challenge posted before the month is gone. 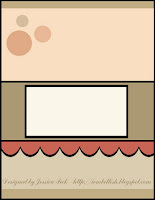 I made my gift bag from digital paper from GinaK "Deck the Halls" Pack. After cutting the bag out, I used a glitter pen to highlight the snowflakes and assembled the bag. I stamped the tree with versamark onto a glittery white CS and embossed with gold EP and colored the image with glitter pens. I cut it out with nesties and matted on to a gold mat and attached to my bag. Closed bag with a gold mesh tie. For my ornament, I made a seashell angel using a seashell I collected in Florida. 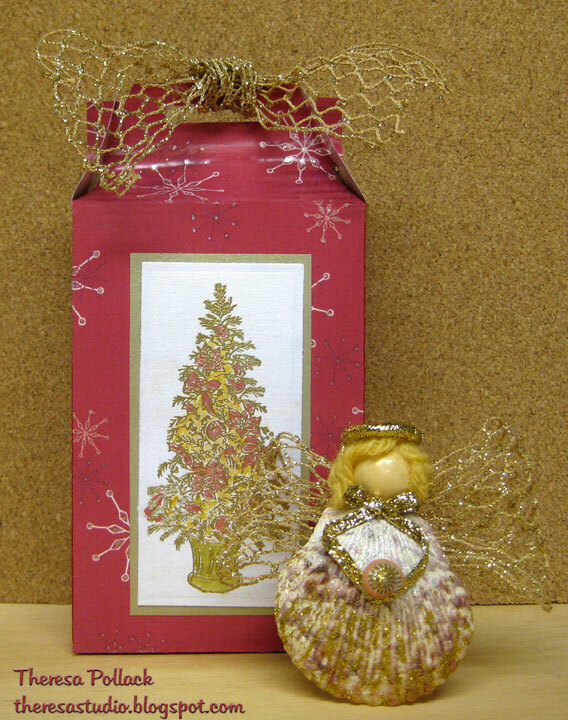 Added wings of gold mesh ribbon, made bow and arms of gold ribbon and attached a tiny shell in her "hands". Used gold glitter glue on shells. Made halo of plastic ring wrapped with gold ribbon that I attached to her head made of a wooden bead and her hair of yarn. Attached a gold cord to back for hanging. She fits nicely into the gift bag for giving. Took time from making pumpkin cookies and cranberry sauce to post this card. Thanks for taking time to stop by. I am rushing to get this posted to meet the deadline but I lost the internet connection so may have missed getting in on time . I used a old stamp that I had never used which I thought was perfect for this challenge. 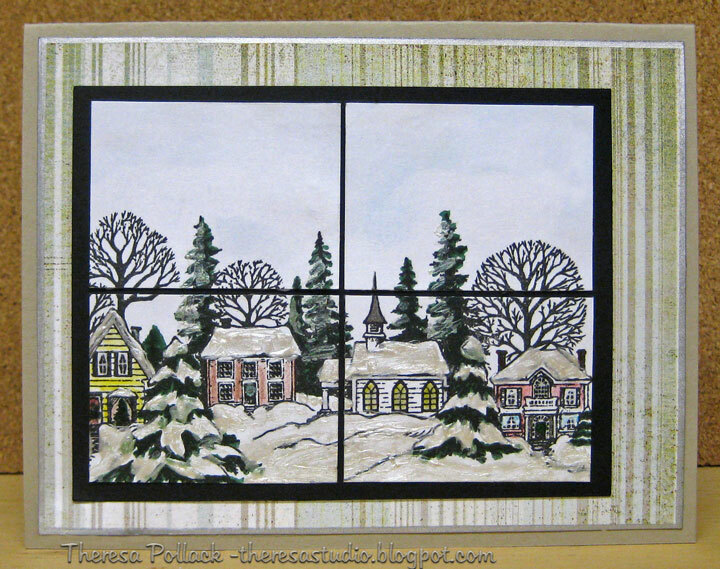 I stamped the Christmas Village using Versfine black on white CS and colored with pencils and markers and highlighted the snow with stickles. I masked the village and sponged the sky with blue. I cut the image into panes and made the window and attached to black CS. I matted on the DP that looks like wallpaper and edged the the mat with silver pen. I attached to a base of Soft Sand CS. I purposely arranged off center. Thanks for looking out my window on a wintery day! PS: actually got this in on time....was mixed up on what day it was...thought the deadline was Mon but it was Tues. Ir's bad when you do not know what day of the week it is! I made a pocket of gold vellum on red and white stripe CS on a red base so you can see the lottery ticket that I slipped into the pocket...punched some holes so snowflakes on the ticket show through. I attached some ribbon on vellum to make it appear like a present and wrapped a ribbon around the ticket with a bow to act as a pull for the prize ticket. 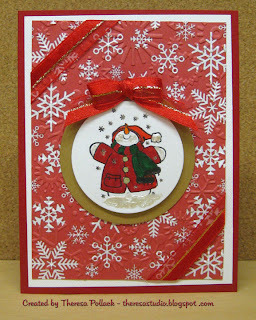 Finished with a ornament tag I made with a Cuttlebug die. 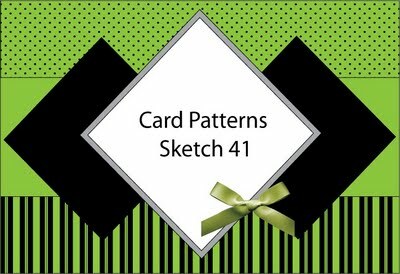 The size of the finished card is 5.5" by 8" so I can use this for the Creative Clear Stamp challenge to make any size card but an A2 (4.25x5.5). This can be square, long rectangle, circle, or any other size card. Do I have to share with my DH any money that I win when I scratch the card? I have spent way too much time on this card! I love the Skating Penguin that I saw on Sue's Blog here and had to go over to http://theresmagicintheair.blogspot.com/ to get the digi. I made this card using a background scene from the artwork in Photoshop Elements. I sized the digi and printed 2 copies-one a mirror image. Then I colored with pencils and OMS and cut out the images ( very difficult because of size). I used Versamark on one image and heat embossed with clear EP. 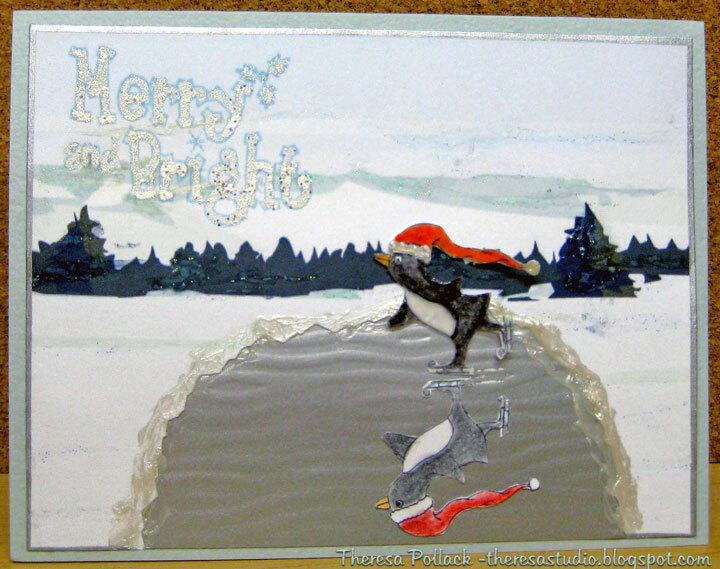 I cut an area out of the background and filled in with silver metallic paper for the skating pond. I outlined the pond with stickles for a snow bank. Added stickles and glitter to sky, trees, and snow which is hard to see in photo. I attached my penguin with his shadow on the pond . Added stickles to his brim and ball on the cap. I used a textured blue Base card and edged the mat with silver before attaching. Stamped sentiment from Creative Clear Stamps in blue, then added versamark with a pen and heat embossed with a glitter EP. Another photo that shows pond better. Enjoy the winter that is on the way! I made this card for a challenge but forgot to post so did not make deadline but I thought I'd share with you. 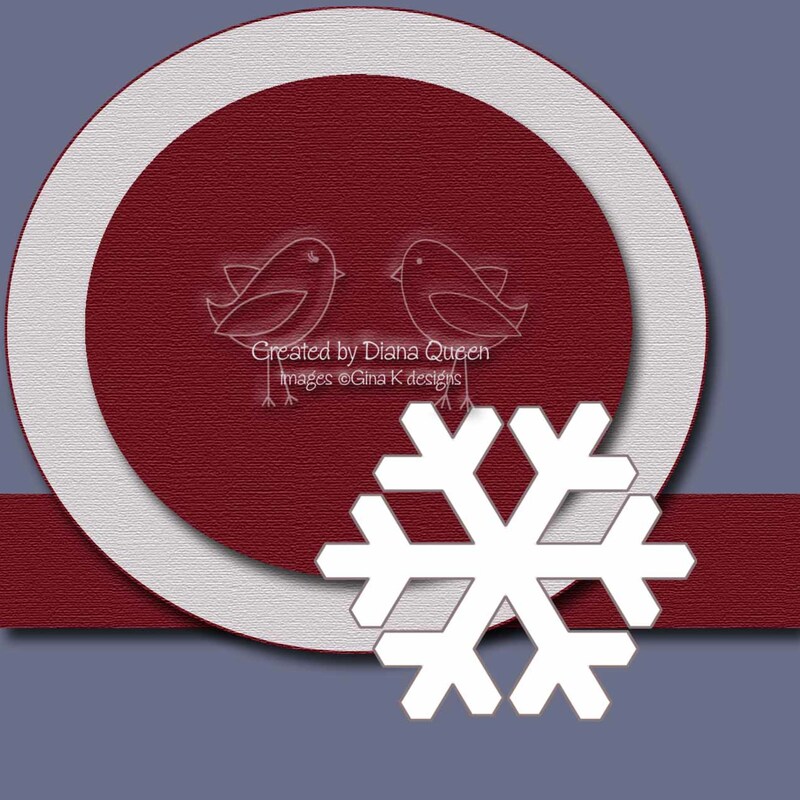 A simple card made with some digital paper (HERE) that I embossed with CB snowflakes. Matted on white CS and red base. Stamped snowman ( Clear Creative Stamps - Let it Snow) on white circle and colored with markers and added some stickles and glitter. Matted on gold circle and attached to card. Added ribbon strips and a bow . 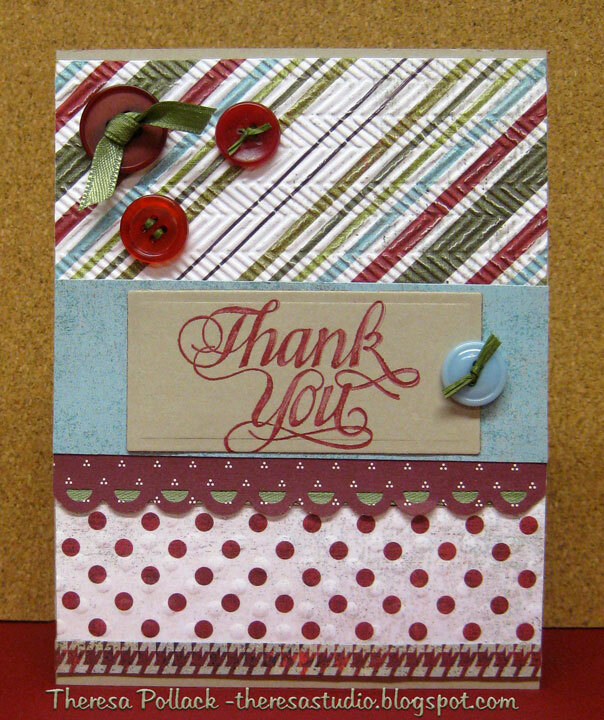 Sharri's STV Potluck Challenge was to make a card on a card. 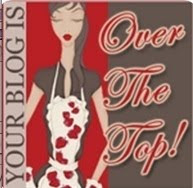 She has great directions on how to make at http://stamptv.ning.com/forum/topics/stvpf39-friday-1113-potluck. Go check them out and see her great card as well. Top photo shows the front of my card. Middle photo shows front card opened and bottom photo shows card fully opened. I am not going into details as how I made since Sharri explains much better than I can. This was a fun card to make. Thanks to Sharri for the great idea! 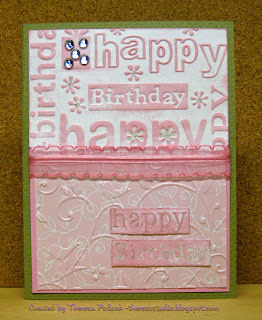 This week's challenge at Jugs is to make a project using dry embossing and to make a birthday card for Dana. 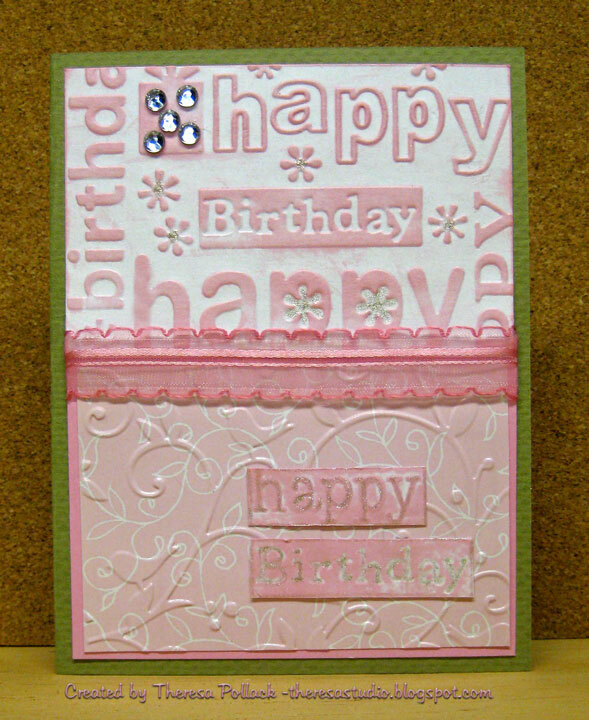 I used a green base cardstock and layered with white CS embossed with CB Happy Birthday folder inked with pink on upper half and CS embossed with CB Birds and Swirls folder on lower part. Used pink and white patterned paper on a pink mat for bottom. Cut out words and attached. Added some ribbon, bling, and glitter to finish. 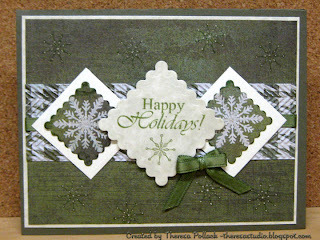 Cindy's color challenge at STV is simply to make a card using ivory and any shade of green. She said "Use as many greens as you wish, as long as you don't try to sneak in any other colors. " I used a dark green base with a ivory mat and a patterned green paper mat. 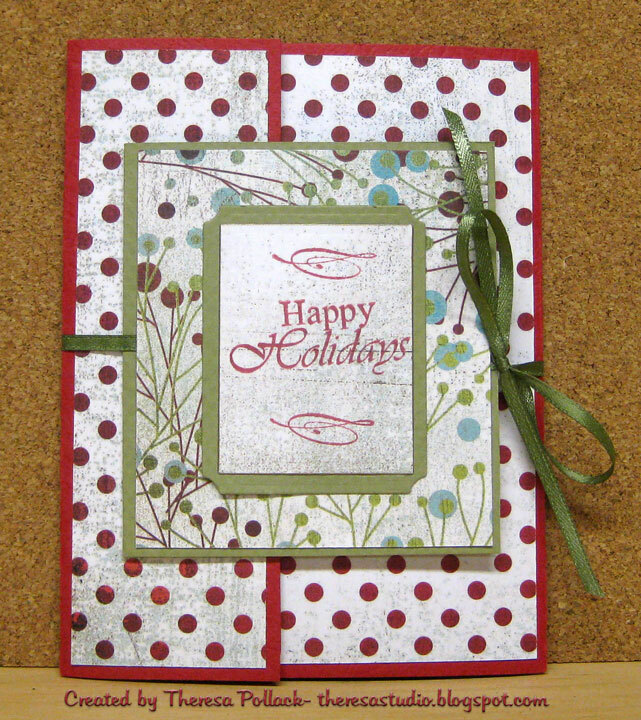 I stamped snowflakes on the background and layered with a strip embossed with CB folder and added a green ribbon. 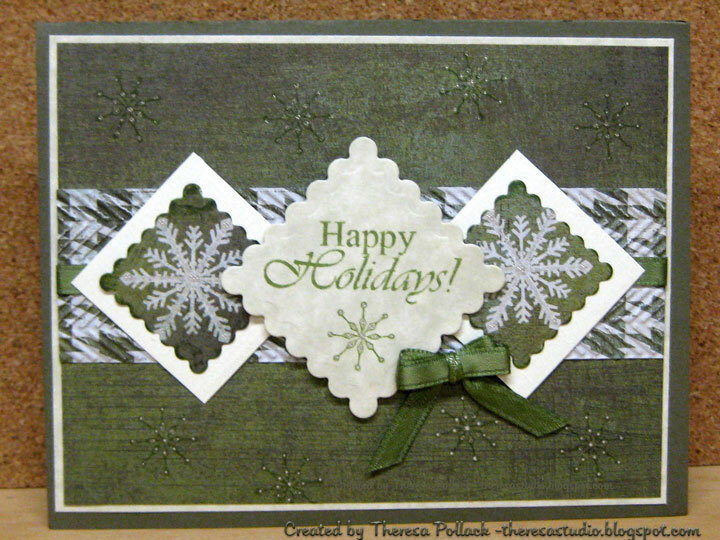 Layered squares with snowflakes cut from PP and center square was stamped with green ink and attached with dimensionals. Added glitter to snowflakes with Sakura pen and a bow to finish. 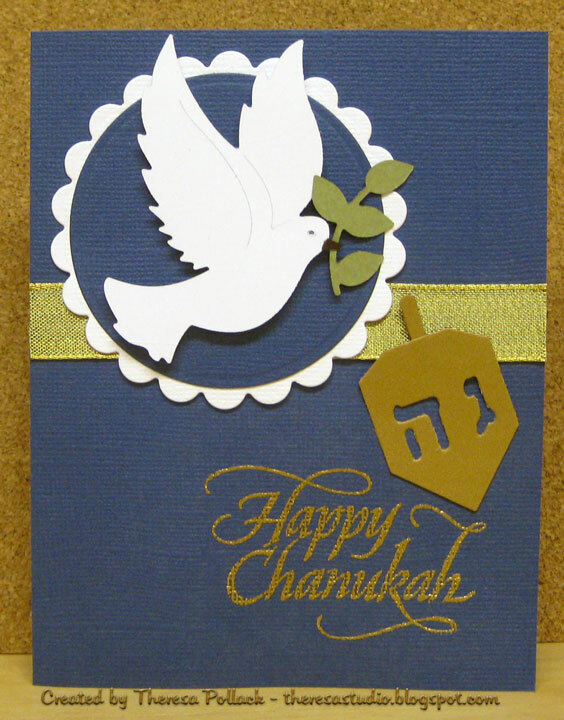 I chose to make a Chanukah card using her sketch. 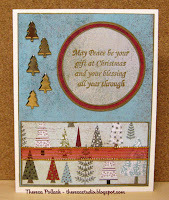 I began with a base card of blue on which I stamped with Versamark and heat embossed a sentiment and added a gold ribbon. I then layered a white scalloped circle and blue circle with a dove cutout attached with dimensionals. Final touch was the dreidel cutout in gold. Gina K challenged us to make a project using Split Negative. 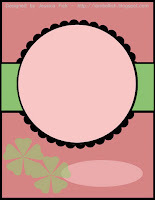 We can make a card, gift tag, or anything we want as long as it has some Split Negative going on! This was a really fun technique...simple and elegant. Shown are the 2 cards that I made following the video and the inside that I printed on the puter. 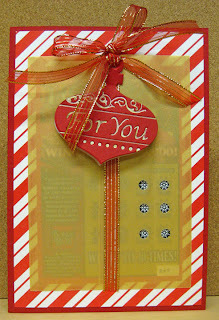 Creative Clear Stamps Sentiment "Holiday Greetings"
Have fun doing a split negative project! 1. Where is your cell phone? Do not have one. 36. Facebook? Yes, but seldom go there. For the Color challenge at STV, Karen chose Ivory, Champagne (light gold), and Burgundy. I am disappointed in how this card looks in the photo ...is much better in real life as they say. using gold ink on bells and burgundy marker for the ribbon. I heat embossed bells with gold ep and then sponged with gold ink....to repeat myself...birl! Colored ribbon with pencils and OMS. I cut oval in patterned paper and layered bells under the oval creating an mat of the ivory showing on the edge. Then attached to mat of champagne (light gold). I attached this to a base card of ivory which is same size as mat. Sentiment that I stamped in lower corner in gold hardly shows in photo but birl. 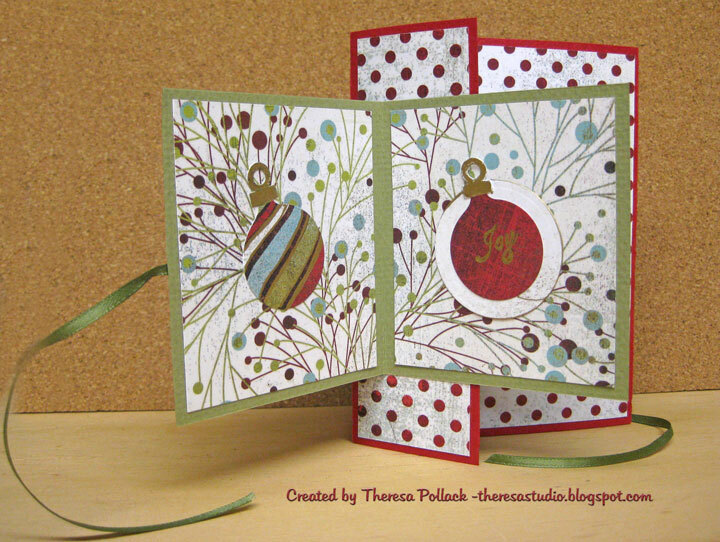 Stamps: GinaK - "First Christmas" by Asela, "A Very Merry Christmas" by Theresa M.
Lee's challenge is to "use a SENTIMENT for your background!! NO dp allowed except what you make on your own with sentiments!" She said: "I'm gonna be super nice and let you do ANYthing else!" I was just dying to use this bear stamp so I designed this card for him. Stamped him on a scrap of light brown cs and colored with pencils and OMS, markers, and white pen. Paper pieced his scarf and added dots. 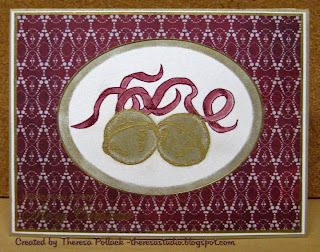 Cut him out with oval nesties and attached to a red scalloped oval. 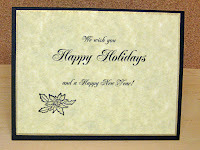 Stamped Ivory CS with sentiments and embossed with Cuttlebug for texture. Wrapped white mat with some brown organdy ribbon. Assembled onto base of red cs and added touch more ribbon. Hope you like my cute bear! Glad you stopped by to see my second attempt at this challenge. For the Creative Challenge this week, the challenge is a COLOR Challenge. The colors to use are Ruby Red, Kraft and Creamy Caramel. 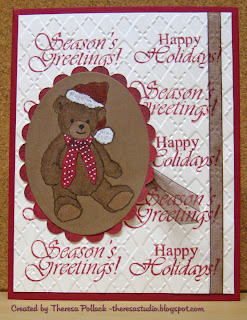 I made this card using stamps from the "Mother Bear" set and then realized I had used brown which was not a color to use....maybe it can count as a neutral color.....but I have not seen many red, kraft or caramel bears! I am going to submit it anyway and the judges can decide if it is "legal". I used kraft CS as the base. 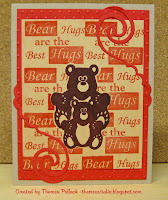 I stamped the bears on caramel CS with brown and masked them to stamp the background with sentiments in red. Added some swirls cut with a Sizzix die. Attached this to an embossed mat of red CS and then to the base. Guess this qualifies for the STV Potluck Friday challenge since it has stamped sentiments. Not all is loss. Jessica's sketch challenge for STV is shown on the right. 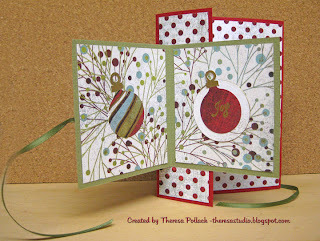 I used patterned papers from Basic Grey to create my card. On the ornament design, I stamped a sentiment with versamark and heat embossed with gold EP. I edged the cutout with gold paint pen and added a bow at the top. 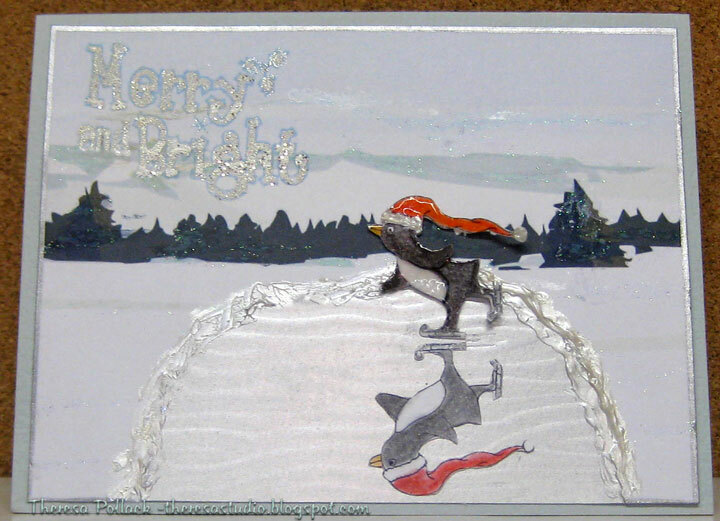 I attached this to a mat of patterned paper wrapped with ribbon and layered this to a blue mat. Used ivory CS as my base. 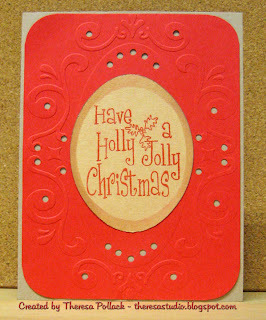 Added some bling and a cut out oval stamped with Joy. 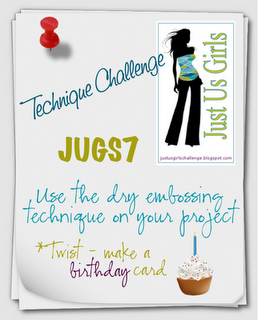 Maria's challenge this week at Just Us Girls is a sketch challenge. See on right. I made my card using a mat of blue cs that I edged with gold ink, added the bottom mat of patterned paper that I also edged with gold and wrapped with ribbon. I stamped sentiment with Versamark and embossed with Gold EP on a circle and matted that with a circle of red patterned cs. Attached the circles and finished with gold tree brads. Used ivory base card. Thanks for stopping by to visit. Please leave a comment. Trying to catch up with my blogging to make up with missing so many days lately. 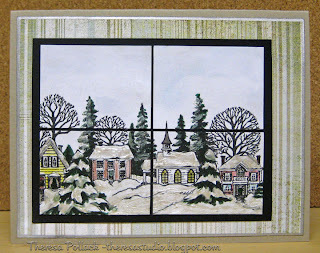 Gina K 's recent technique challenge is to make your project shine by Glazing it Up! You can use Crystal Lacquer, Glaze Pens or anything else that will create a glossy, glazy, finish. 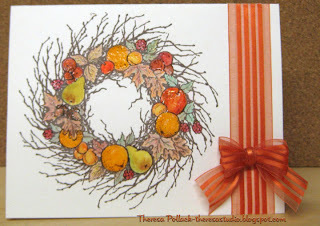 I made this simple card by stamping a wreath with rich cocoa on an ivory cs. Painted the fruit and leaves with pencils and OMS. Glazed the fruit with versamark pen and clear ep. Used glitter pen on leaves. Added ribon and bow made with my new Easy Bow maker. Made some pics of my studio to share with you some things I added recently. On the right is my ribbon display on two metals rods that I suspended with fishing lines from the ceiling. Now I can see all the colors without going through the baskets that I had stored them in. Showing in the middle is an old bulletin board I put to new use by adding magnetic strips. Now I store my Spellbinders here and have room to add more. I now use mugs and old canisters that I store pencils, pens, markers, scissors, etc instead of using drawers beneath the counter. Not shown is a lazy Susan on the counter that I have placed some of the mugs on top as well as other items that I use most often. Will share more as I make some more pics. Last week I was excited to receive my prize that I won from Scrapping Cottage. Pictured are the items that I selected in my $250 Shopping Spree. Thanks to Joanne for this great gift and for selecting me as the winner! Thanks for stopping by...got to go and play with my "stuff". Finally got to do some carding on Sunday. Yeah!!! Last Friday, I received an order from GinaK and my prize from Scrapping Cottage ( more on this in another post) so I was really anxious to spend some time in the Studio. 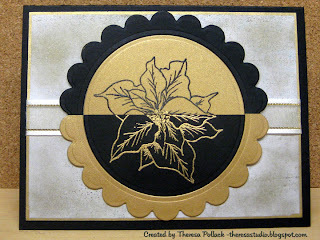 Last week, Sue's color challenge over at STV was to use purple, gold, and black. I entered my card just before the deadline last night. 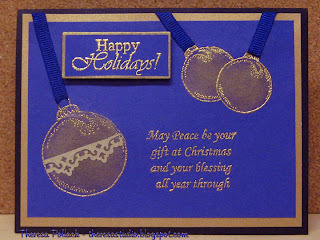 I stamped ornaments with versamark and heat embossed with gold ep on my one and only piece of purple cs. Sponged the ornaments with gold ink and added a strip of thin gold paper on the larger ball. 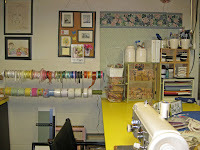 ...this pre-punched strip was in my scraps left over from another project. I never throw anything away. Added purple ribbons to each ornament. I stamped the sentiment on purple card and then added another sentiment using dimensionals. 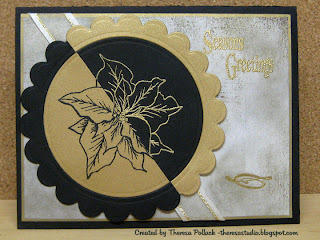 I attached the card to a gold mat and then to base card of black. 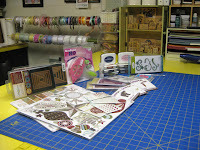 Have been busy with so many projects that I have not made any cards. On Saturday, Sunday, Monday, and Tuesday, we were busy raking and cleaning up leaves that all seemed to drop at the same time. But we can finally see the grass again. My DH did most of the work but I tried to be supportive by being outside with him. Think we got most of that work done in time because we had a mix of snow and rain all day yesterday and it's getting colder by the day. I have also been working on gift calendars that I design and print...make about 25....some that I personalize with birthdays,etc. And also am planning a birthday party for my Mother who turns 90 in January and working on invitations for that event. Today we are having a large old pine tree cut down which will involve being outside most of the afternoon.